The cruise director lets out a yell and within a minute we are on the ship’s starboard side, to see what is going on. A fisherman has drawn up to our ship in his dugout canoe, hoisting a bag of fresh squid, hoping for a sale. 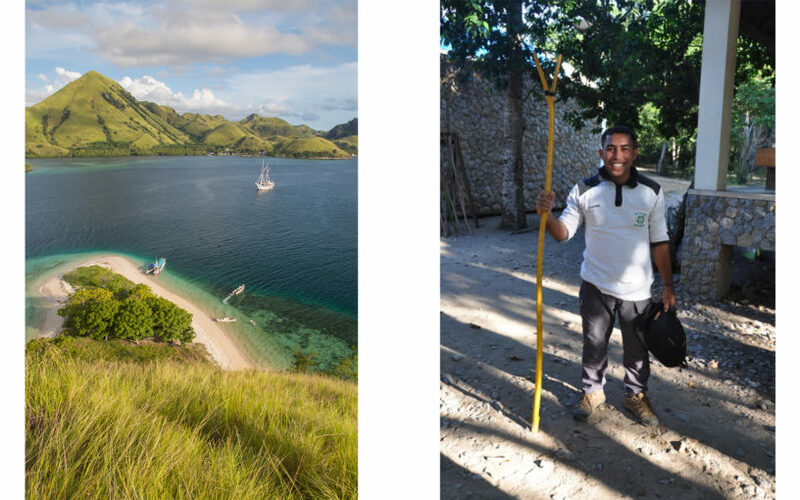 “Whenever they see our ship has arrived, they always come to sell us their fresh fish,” explains our guide, Arie Pagaka. Just as he hands the silvery haul to our ship’s chef, another fisherman paddles up, late to the party, but hoping our enthusiasm might trigger another purchase. We are midway through a cruise in Indonesia with SeaTrek Sailing Adventures, which runs eight- and 10-day trips on majestic, two-masted phinisi. These enchanting Indonesian sailing ships have been used for centuries by sailors, merchants, and explorers who ventured to some of the archipelago’s most remote islands. One of them, the Victorian naturalist Alfred Russel Wallace, discovered the theory of evolution at about the same time as Darwin, while exploring these islands. Not celebrated in his time, Wallace is now a cult hero among evolutionary biologists, counting Sir David Attenborough among his legions of fans. Whether you’re wild about Wallace, or just love being on the water, there’s no better place in the world for an intimate sailing adventure. Best of all, tourists here are still few and far between. This is barefoot luxury at its finest, and SeaTrek is a pioneer in this style of travel, cruising these waters since the 1980s. Today, they operate the 24-passenger Ombak Putih and the 12-passenger Katarina, both oozing with Indonesian charm and offering the kind of simple luxury and personal service you only find on vessels like these. Voyages are offered year-round and vary from tours of the Spice Islands, to specialized trips focused on seabirds, tribal ikat weaving techniques, and Wallace himself. The archipelago’s 17,000 islands offer infinite variety along the volcanic Ring of Fire and many expert-led trips bring scientific minds on board to interpret and enrich the experience for passengers. Ombak Putih’s main deck is dominated by the 82-foot-tall main mast, where sarong- and swimsuit-clad guests gather for dinner or relax on lounge chairs. Nightly talks are delivered by the cruise director or onboard experts, and daytime adventures include plenty of snorkeling, island walks, and visits to villages. For many travellers the highlight of this particular trip from Bali to Flores is a stop at Komodo island to see its eponymous lizard population. 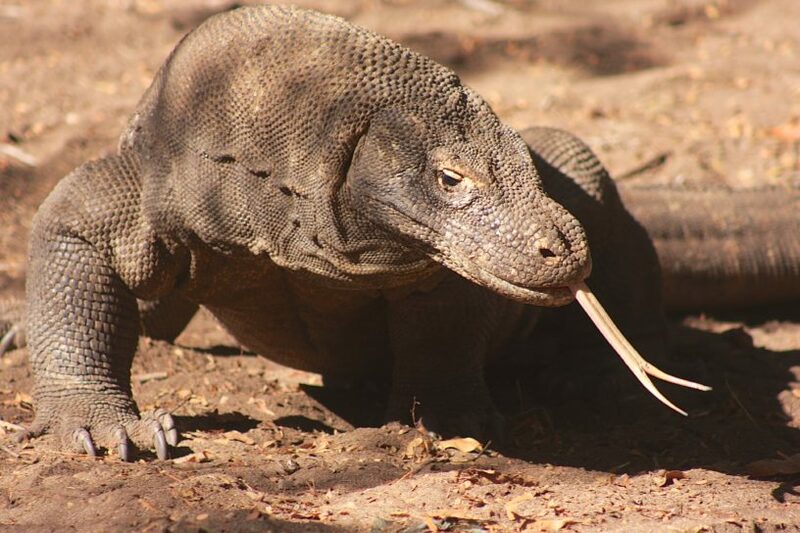 It’s quite a jolt when you first lock eyes on a Komodo dragon, knowing that hapless travellers have gotten seriously injured after wandering off by themselves—a no-no in this national park. Sensible folk follow one of the official guides who use a long staff with a fork at the end to ward off any Komodo dragon that gets too close. On our walk through the bush we spotted several dragons lazily basking in the sun while their prey—a mix of deer and wild pigs—wandered nearby. One of the joys of small-scale tourism is being able to visit villages and spend meaningful time learning about local customs. We visit a shipbuilding village where a massive pile of logs is being transformed into a phinisi, a massive effort that takes more than a year to complete. On another island, we stop at a village where the once nomadic Bajao people have settled permanently. Nicknamed “sea gypsies”, they once lived entirely on their boats, but with changing times, have settled in houses built on stilts over the sea. On the island of Flores, our final destination, we watch young men challenge each other with wild leaps accompanied by the lashing of whips in a dance called the Caci, which ends when the first drop of blood is shed. Along with the diversity of cultures in Indonesia is the incredible undersea life, with its coral diversity and sheer abundance of marine animals: mantas, turtles, and dolphins can be found alongside immense globes of brain, lettuce, and elkhorn coral, hiding all manner of colourful fish. And there’s no need for scuba gear: it’s all on view within a metre or two of the surface. Eventually it’s time to say goodbye to the crew and the ship. After an intimate adventure like this one, it’s hard to imagine being on board with more than a dozen people, let alone 100 or more. Sailing through these storied waters in one of the most diverse regions of the world is a thrill hard to replicate anywhere else. With so much left to explore, we spend our last night poring over maps, plotting our inevitable return. Thanks to Nuvo Magazine for the great story and permission to reprint.